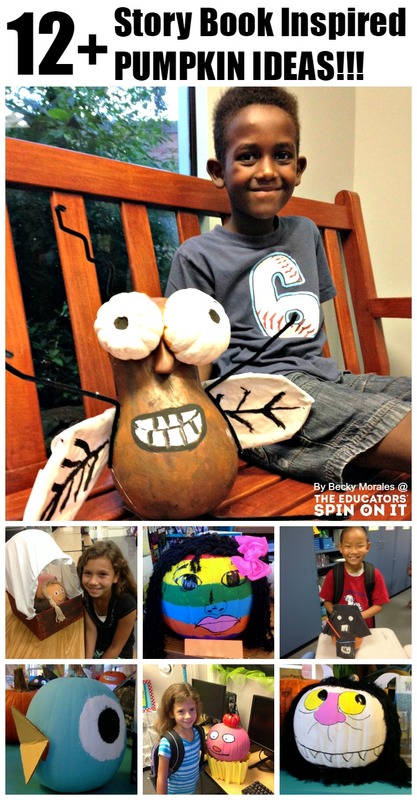 12 Storybook Pumpkin Ideas to help your Child’s Pumpkin Stand Out! 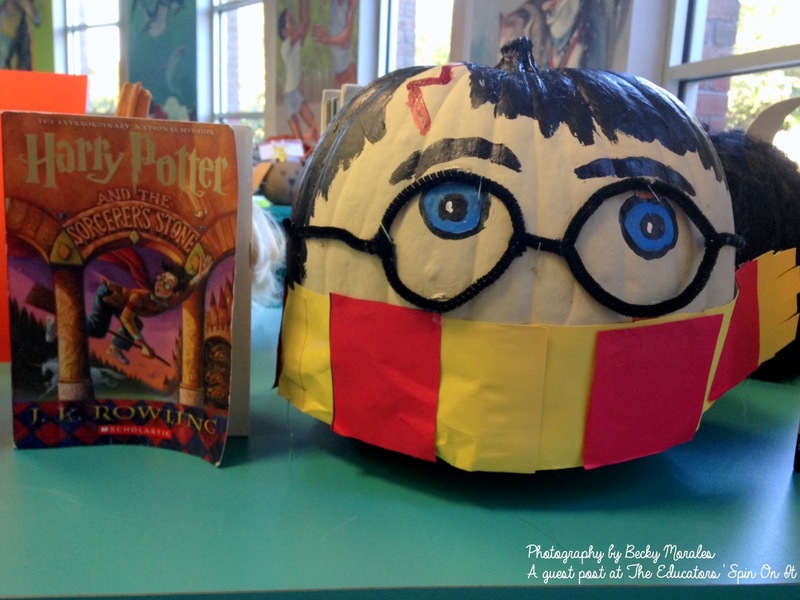 Does your child need to decorate a pumpkin inspired by there favorite book? 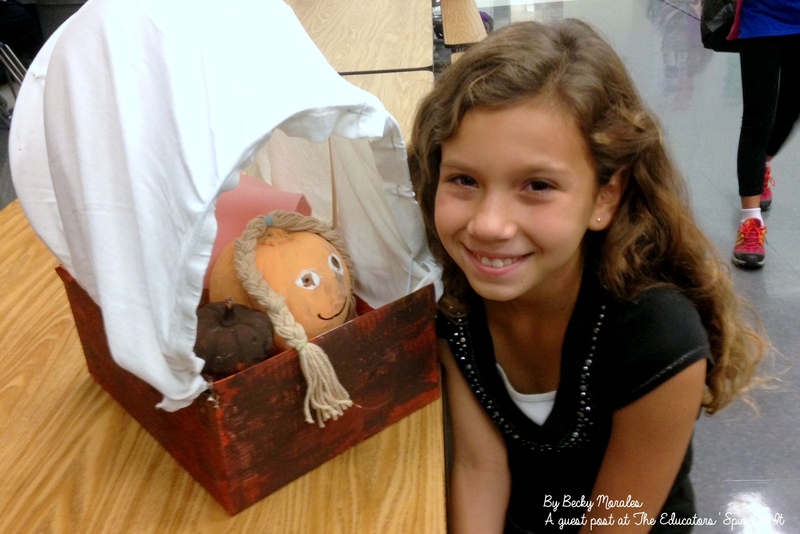 Here are 12 easy to make storybook pumpkin ideas to inspire you. 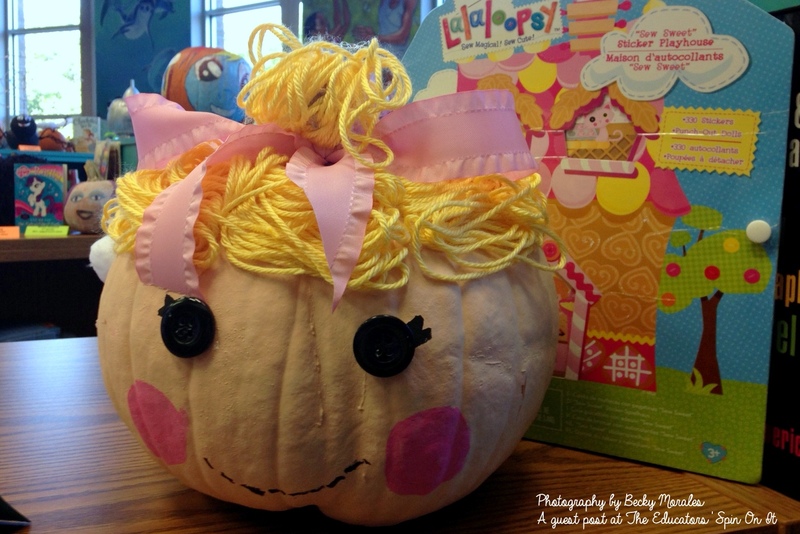 Celebrate literacy and creativity with this hands-on collaborative story-book pumpkin activity. 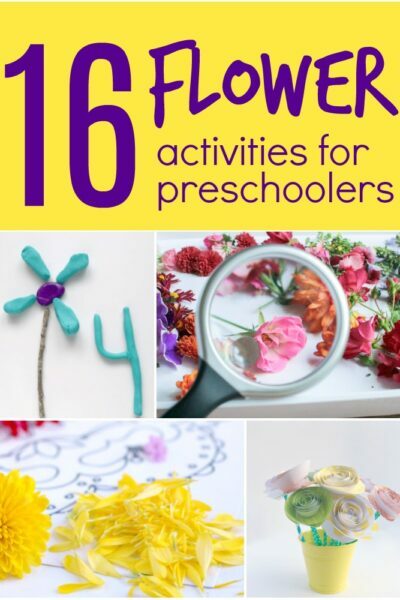 Make one for your front porch or ask your classmates to join in for a whole class activity. 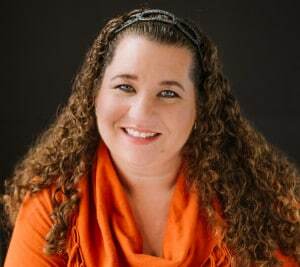 Today, we have a guest writer here at The Educators’ Spin On It to share this awesome Story Book Pumpkin Literacy Activity that her school put together. The pumpkins were created by the children and their families for a family literacy night and displayed in their school library. 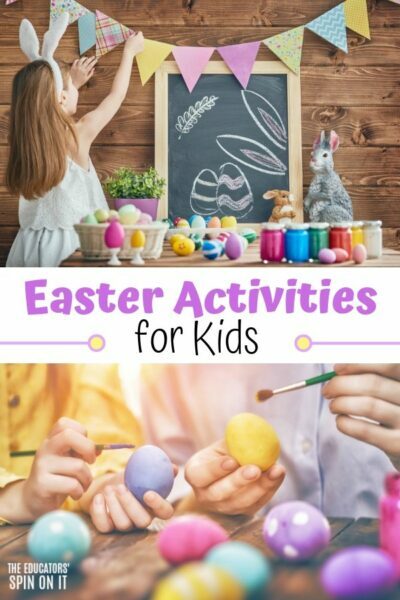 There was so much excitement and positive attitudes towards literacy and creativity that Becky Morales wanted to inspire others to try this simple, but oh so fun activity with their children and students. I love the pumpkin recipes and fall decorations- maybe because I live in Houston where we don’t really have four distinct seasons. Despite (or maybe because of!) our lack of changing leaves and cool temperatures, we DO have lots of pumpkins, and families and schools decorate for Halloween throughout October. 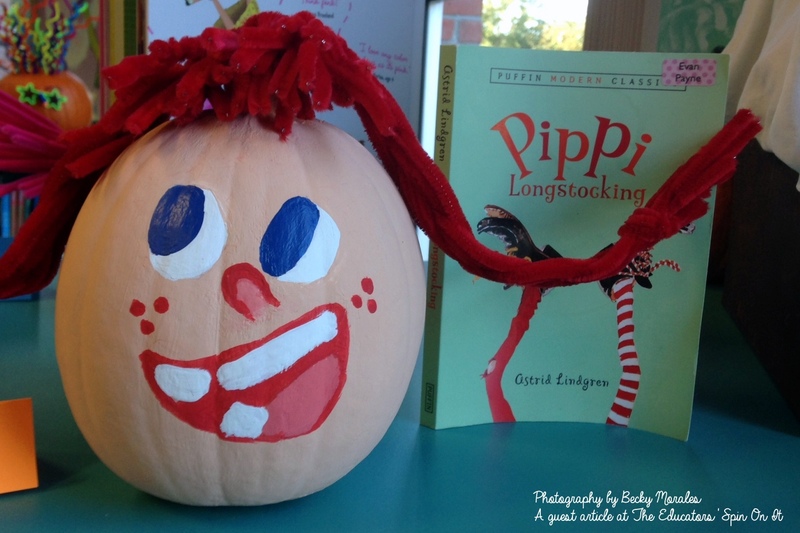 One fun activity our school organized this fall was a school-wide project called “Storybook Pumpkins.” Each student who was interested could prepare and and decorate a pumpkin as a character from their favorite book. Their literary creations would be displayed in the library until Halloween for all to see! Often we paired the pumpkin with its book, or at least a picture of the book cover. 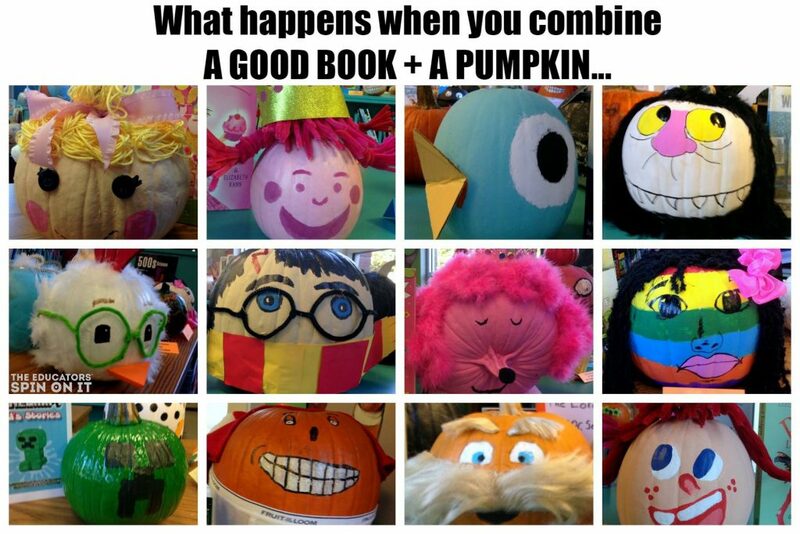 The students were so creative, and we had a huge variety of storybook pumpkins! To make your own character jack-o-lantern, begin by picking out the perfect pumpkin. For Fly Guy, we found a long and skinny squash, but for the cupcake from Bake Sale we found a very round and fat pumpkin- and a tiny pumpkin for the cherry on top! Pumpkins take paint really well- we used regular acrylic paint to paint directly on the dry pumpkins. Next make your accent pieces: for example yarn braids for Laura Ingalls Wilder, tissue paper and pipe cleaners for Fly Guy’s wings. We used hot glue gun to attach our pieces to the pumpkins. JOIN OUR HALLOWEEN BOOK CHALLENGE! Here are just a FEW ideas that the students and their families came up with. 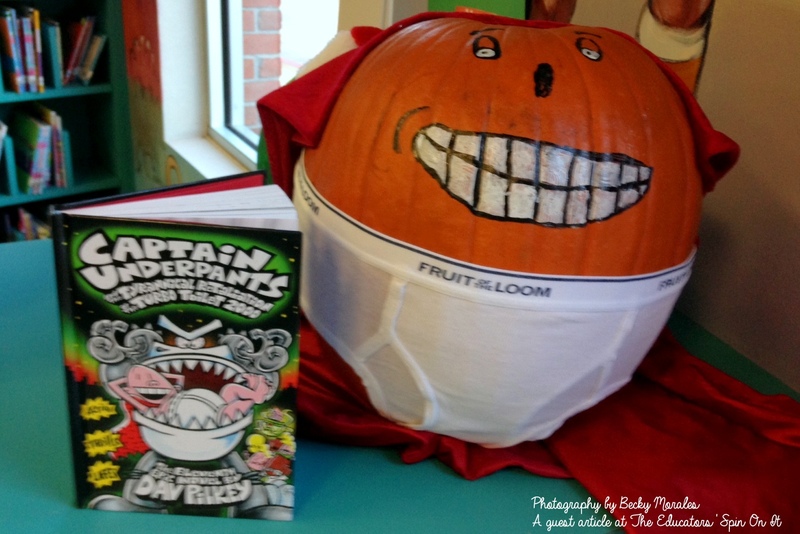 You can use these as inspiration for creating your own pumpkin story book character! Paint the pumpkin with a skin toned acrylic paint. Paint the Eyes and hair. 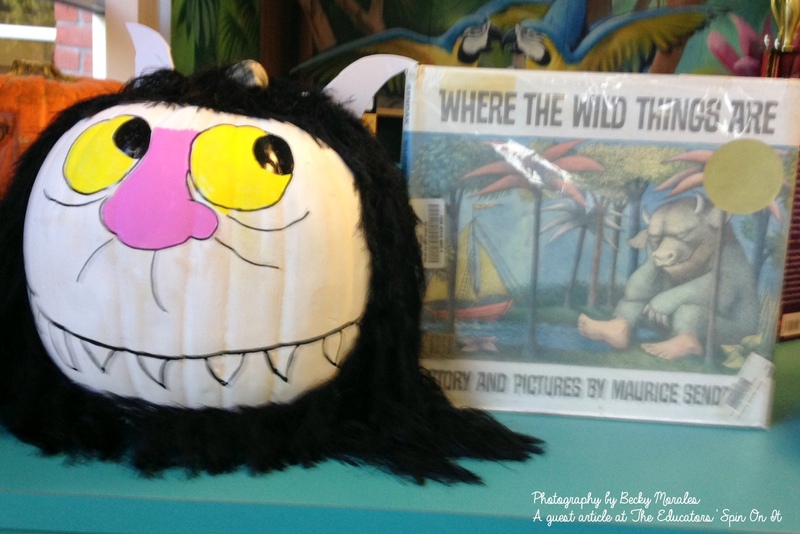 Cut a paper scarf out of construction paper and hot glue it on the bottom of the storybook pumpkin. Using a craft stick or wire, make and attach the glasses. 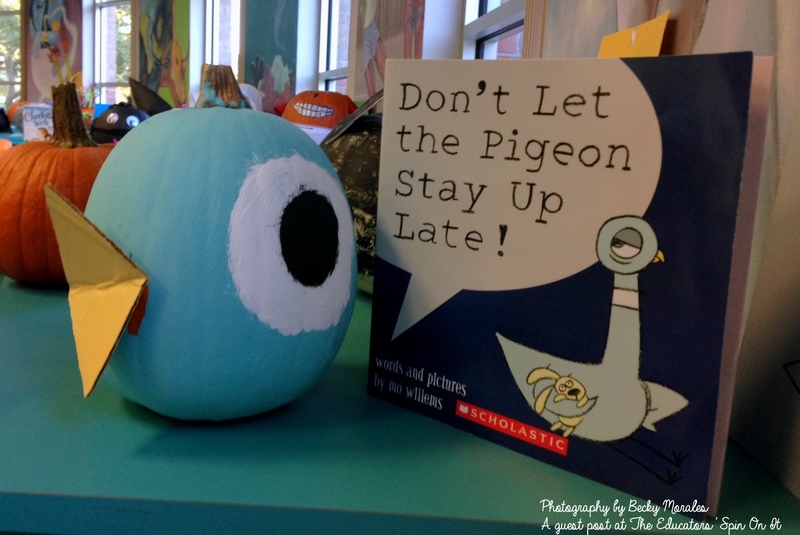 Directions on how to make the Don’t Let the Pigeon Stay Up Late! Paint the pumpkin teal blue. Paint the Eyes with large white and black circles. Cut a yellow diamond out of construction paper, felt or cardboard and glue in the middle. 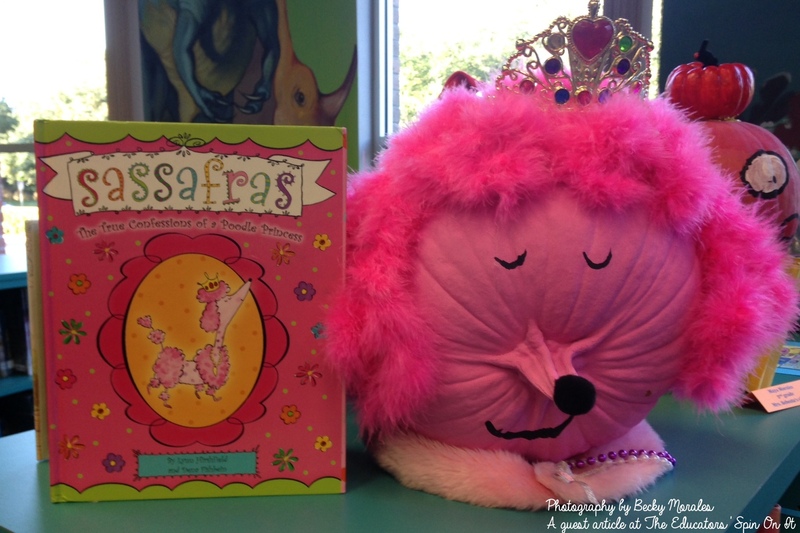 *** Make a Mo Willams inspired duckling headband to go along with this story book pumpkin too! Paint the pumpkin white and let dry. Draw on the facial features with a black permanent marker. Paint the eyes and nose. Cut white horns of card stock or cardboard and glue to the top. Paint the eyes and mouth. Use faux fur, yarn, or even a yellow boa to create the eye brows and mustache. Glue on a felt of pom-pom nose. Paint the pumpkin light pink. Add the facial features in dark pink. Glue on chenille stick or yarn hair. Add a store bought or kid made sparkly crown to the top. *** Are you a PINK fan? 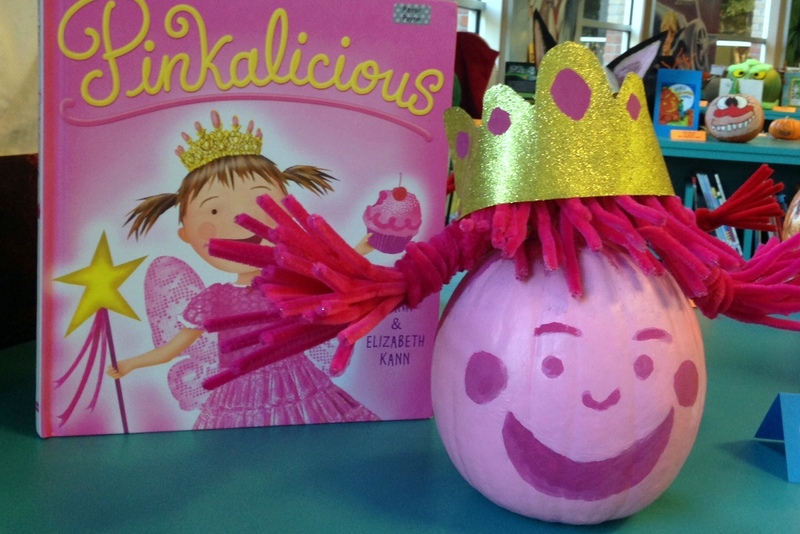 Make a pink pumpkin of hope for Breast Cancer Awareness. Directions here. Paint the pumpkin with a skin tone. When dry, paint on facial features. Using chenille craft sticks or yarn, glue on the hair. Twist upwards. Turn the pumpkin on its side and paint on eyes and a mouth. Glue a black pom-pom on the stem for a nose. Glue faux fur or a hot pink boa on the top. Add a collar with soft fabric. Glue on bling to make it fancy. Glue on a new pair of underpants to the pumpkin. Cut a cape out of fabric and glue to the back. 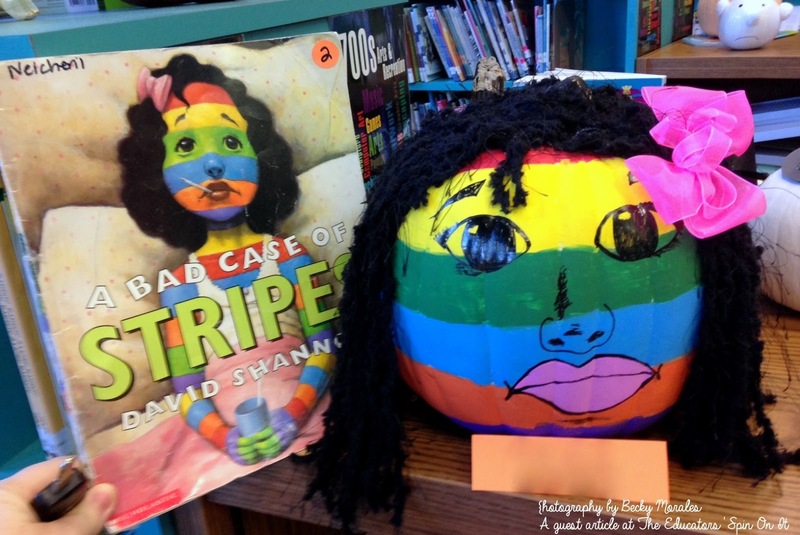 Paint horizontal stripes along your pumpkin in vibrant colors. Glue on yarn to the top. Clip on a pink bow. Paint the pumpkin skin toned color. When dry, pain the mouth and cheeks. Glue on buttons for the eyes. Pile and glue yard on top of the pumpkin. Tie a large bow around the pumpkin stem. Paint the pumpkin a skin tone color. When dry paint a face. Make a nose out of air dry clay. Glue before painting. Paint the gourd brownish gold. When dry, add a mouth. Make wings out of paper towels or felt and glue on. Paint two mini pumpkins white. Glue the mini pumpkins to the top for eyes. Paint a black circle in the middle of each. 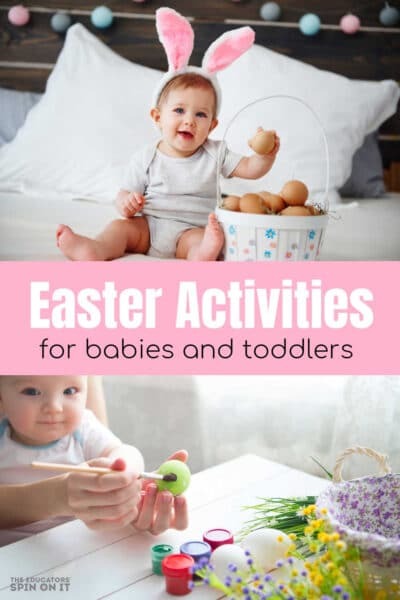 Add chenille craft sticks for arms, legs, and antennae. 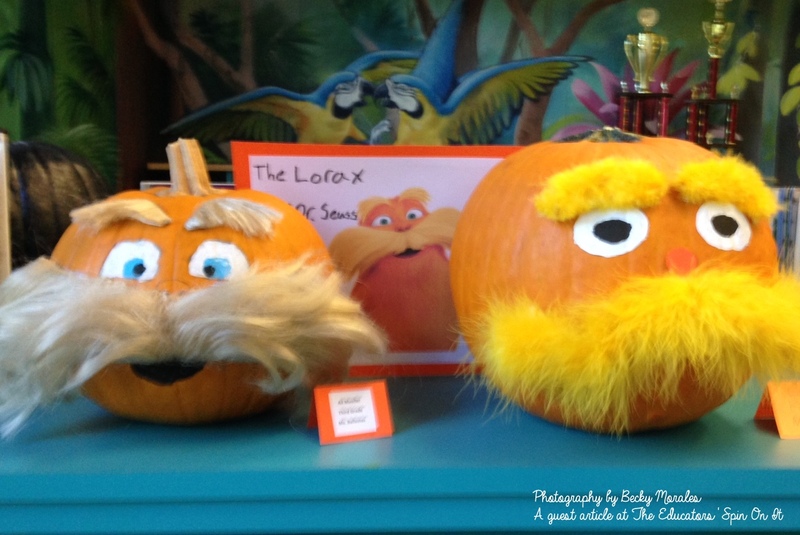 Celebrating literacy is a great way for the kids to engage their creativity and showcase their favorite books— plus browsing through the rows of pumpkins was fun to try and guess the characters. I hope you enjoyed these whimsical storybook pumpkins. If you’re looking for more pumpkin activities, see how to learn with pumpkins and activities in every academic subject. Also check out this fabulous pumpkin math, science, and literacy packet for more hands-on pumpkin activities! Special Note: If asking children to bring in their pumpkins to school for a collaborative display, it might be important that the children do not actually carve the pumpkins or puncture the skin with pipe cleaners and accessories; keeping the pumpkin whole helps the pumpkins to last longer and won’t invite unwanted insect visitors. 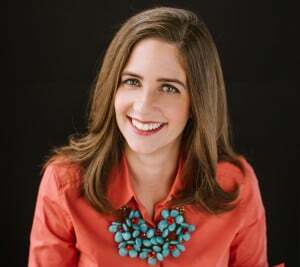 Becky Morales shares activities to teach kids global and cultural awareness at KidWorldCitizen.org. 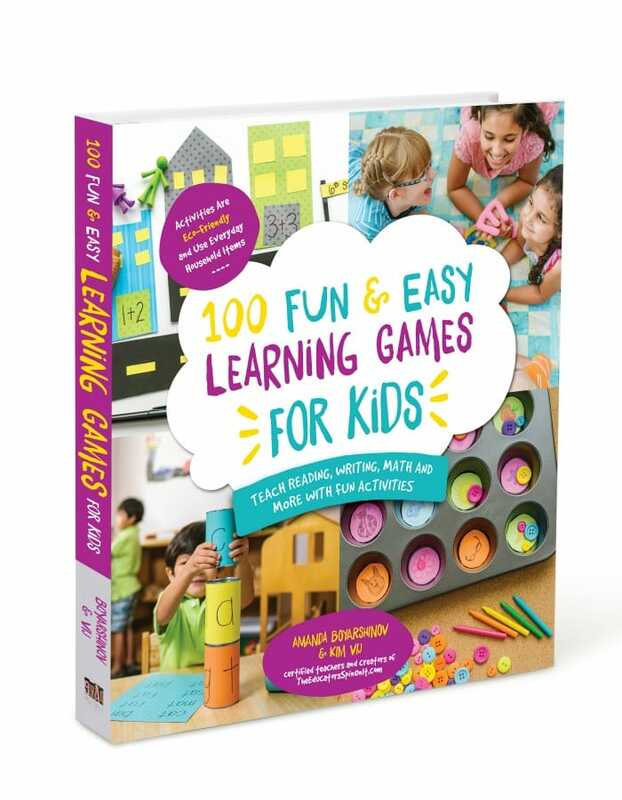 She also recenty co-authored a book for parents and teachers called the Global Education Toolkit for Elementary Learners, authored with hundreds of activities and resources to expand young minds and go global. 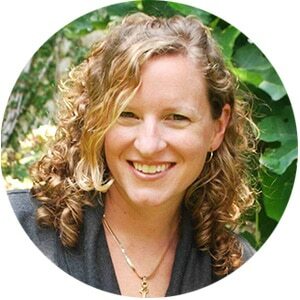 She is the mother of 5 active, multicultural, and bilingual kids who keep her busy laughing. 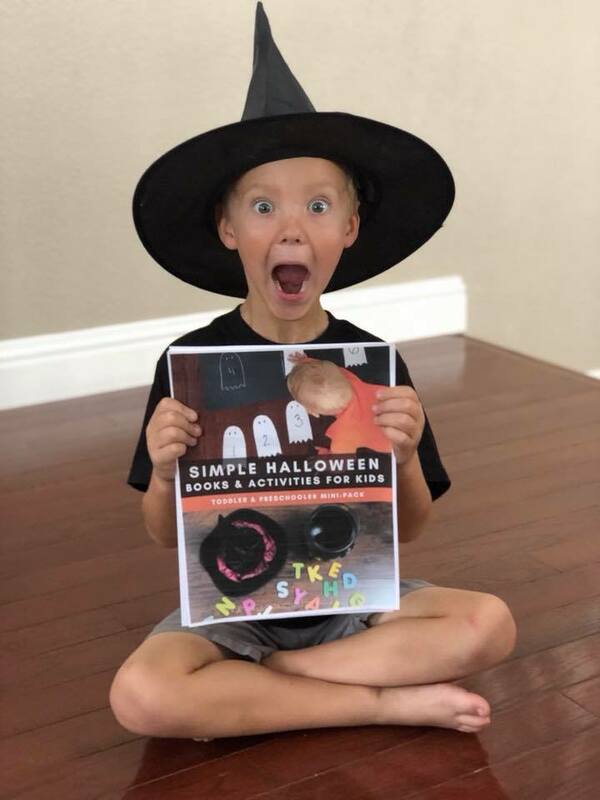 Sneak in a little literacy fun this Halloween! 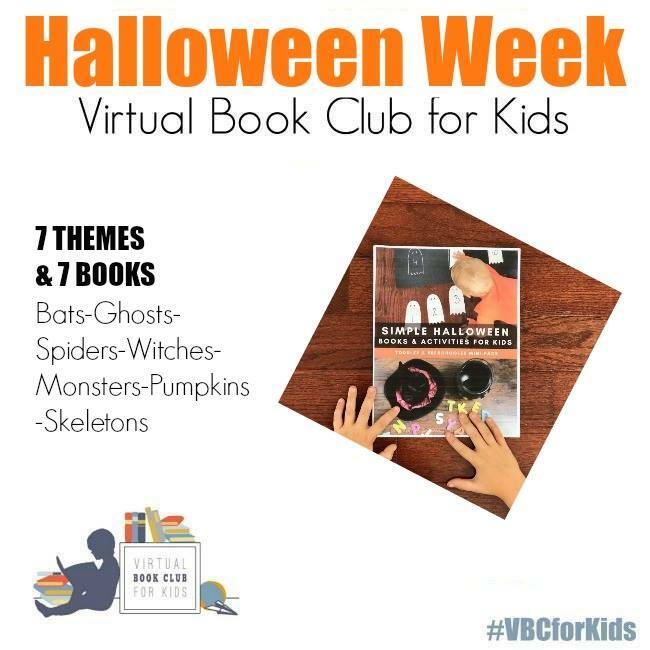 JOIN OUR Halloween Book Challenge! I absolutely love this idea!!! Now I am trying to figure out which story to do. LOVE it! Thank you! Wow! First, I love the creativity and artistry that these pumpkins show. And, secondly, I love all the books used as examples. 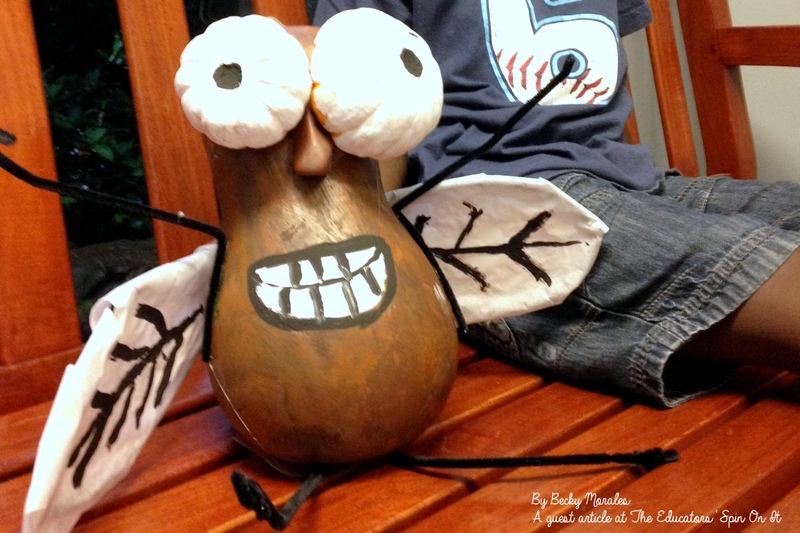 My favorite has to be the Harry Potter pumpkin, but my girls love the Fly Guy pumpkin! Pure Awesomeness!